Oatmeal Packet Cookies: If you’re like us, you love those huge boxes of flavored instant oatmeal packets from the local membership warehouse. They’re fun, convenient, and contain enough pseudo-food to satisfy a small army. If you’re in the mood for cake mix cookies, check out here. Unfortunately, there’s always some flavor in the boxes that no one in the household will eat. Packets of the unwanted flavor accumulate endlessly, taking over the kitchen cabinets and eventually sprouting vermin. Until now, that is. Using our recipe, you can recycle the unloved oatmeal packets into a steaming plate of unhealthy, sugar- and fat-laden cookies. If your family doesn’t like these, tell the lazy ingrates to get off their rumps and make their own darned cookies. 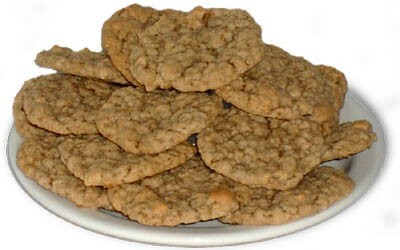 This is the classic Oatmeal Packet cookies recipe for any special occasion! Mix all ingredients except flour and oatmeal packets. Roll dough into 1 1/2 inch balls and drop onto an ungreased cookie sheet, about 2 inches apart. Smash the balls down to a thickness of about half an inch. Bake until light brown, about 10 minutes. Allow to cool on cookie sheet briefly, then remove to a rack to finish cooling. Very good! I added some raisins and a teaspoon of vanilla! My instant oatmeal packets were of various flavors…I used them all…very fun cookie! Hubby can’t stop eating them…I may have to hide some!